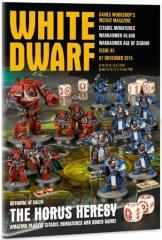 White Dwarf 93 arrives and the Heresy begins! The brand-new Betrayal at Calth boxed game brings us the first ever plastic Space Marine miniatures for the Horus Heresy. Take a look with New Releases, Paint Splatter, a play-through the game in ‘The Wrath of Veridia’ and a special background feature in ‘The Seeds of Betrayal’, making for a very special issue completely dedicated to this groundbreaking release. What more could you want? How about a free gift? Grab one now, before the blast doors close forever.